Knowing, and not knowing, a lot. To update from last post, I LOVED Twelfe Night. It was hysterical. We even had a bit of unexpected drama during the show: one of the audience members in the on stage seating fell ill and needed to be taken to the hospital mid-performance. The cast handled it really well, and the interruption didn’t affect the performance at all. It was a really enjoyable show, and we had fun doing the stage door afterwards. 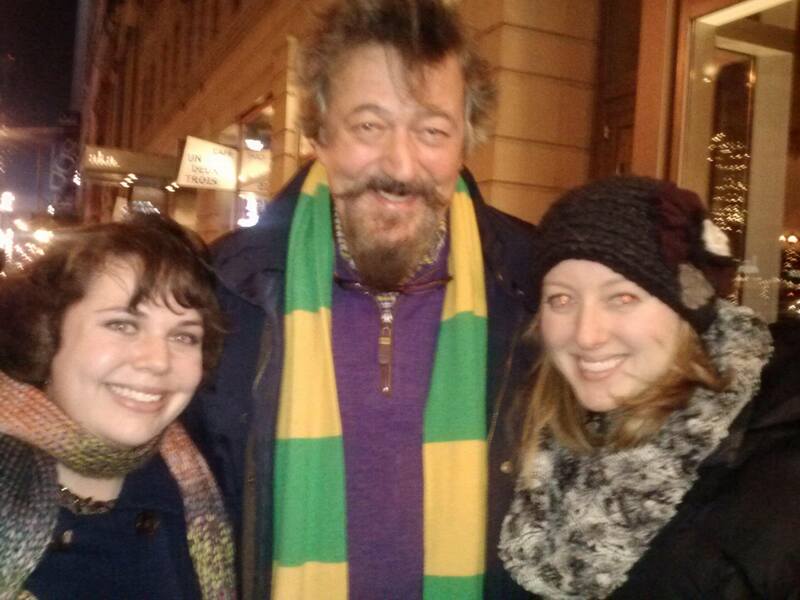 Stephen Fry was in a hurry after the show, so I didn’t get to talk to him and tell him how much I love his work, but we did get a picture and an autograph! We met most of the cast, including Mark Rylance who was an absolute doll. He seems like such a sweet, quiet man. It’s amazing that dastardly Richard and the funny Olivia can come from such a soft spoken man! The holidays were lovely. I really can’t imagine how they could have been better. My flight back to Ohio went smoothly (no sick passengers behind me this time!). 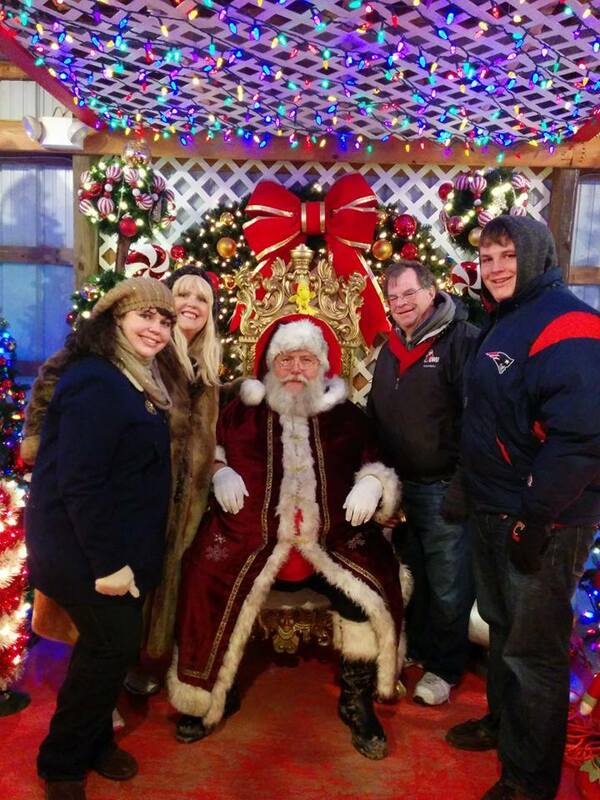 Mom and I had a girl’s day on Saturday, and the boys and I went to the Festival of Lights that night to see Santa (Mom insists we get a picture every year: he who believes receives, after all). It was perfect weather, and the zoo was gorgeous as usual. Sunday we saw the Playhouse in the Park Production of A Christmas Carol. I love their production; the set is simply amazing. Marley’s appearance scares me every time! Monday we ventured out to the Christmas Ranch. I don’t know the whole story, but it’s a huge ranch that totally decks out its halls for Christmas. Lights EVERYWHERE. And of course more kitschy Christmas shops than you know what to do with. It was very fun, if very cold, and definitely festive. Christmas Eve and Christmas Day were lovely: full of family and gifts and good food. I think everyone was happy with their gifts; I got some new nail polishing tools I’m excited to try, as well as some lovely new outfits. My brother got the bulldog he’s been asking for (albeit, it’s a stuffed one and not the puppy he really wants). The day after Christmas is my aunt’s birthday and we went to a fancy steakhouse to celebrate, which was nice. Friday we finished up the week with dinner at LaRosa’s. I think I got all my Cincinnati cravings taken care of until next time I can go home. All in all, it was a really nice week. Going home these days is weird. I’m never there long enough to get sick of it and I’m on vacation, so when I return to New York and responsibilities and work, it’s hard not to be nostalgic about Ohio, as I’m sure you’ve seen from previous posts. Of course I know that if I lived in Ohio I’d have many of the same concerns I have here. I’d probably fight more with my family, I’d be bored and weird and drive a car. But after a week of being taken care of and not worrying, it always takes a day or two to adjust from Ohio Chloe back to New York Chloe, whoever she may be. Luckily with New Years Eve coming up, I should be back to NYC party mode in no time. I had several people over the week at home tell me they enjoy reading my stuff. I can’t imagine why; I feel like these lists of things that I did are rather boring! But, it is nice to get everything out on paper (I guess this counts as paper? ), so I’m going to try to write more in the new year. I’m not going to go so far as to say it is my New Year’s Resolution; blogging has to come after all the other crazy things I’ve got planned for 2014. But, I shall try to make more of an effort to blog, hopefully I’ll start later this weeks with tales of our New Year’s Eve escapades.